The flamboyant Corcoran had a long and successful career as a minor league pro quarterback, achieving a near-legendary status due to his performance on the field and eccentric behavior off of it. He spent the better part of his first six seasons in the Atlantic Coast Football League. With Wilmington in 1966, he led the ACFL in pass attempts (247) and with Waterbury in 1967 topped the circuit in attempts (309), completions (141), yards (2065), and TD passes (19). Corcoran was cut by the AFL’s Denver Broncos during both the 1966 and ’67 preseasons and was signed to the New York Jets’ taxi squad. He started the 1968 season with Bridgeport, which acted as a minor league team for the Jets, and after he was sold to another AFL club, the Boston Patriots, continued in the ACFL with Lowell, Boston’s minor league affiliate. Corcoran again led the league in pass attempts (333), completions (166), yards (2158), and TD passes (20). He also played in two games for the Patriots, throwing seven passes, two of which were intercepted. In 1969, after failing to catch on with the Philadelphia Eagles of the NFL, Corcoran joined the Pottstown Firebirds for two seasons and led them to an 11-1 record in ’70, a year in which he topped the ACFL in pass attempts (297), completions (164), completion percentage (55.2), yards (2129), and TD passes (24), although an injury caused him to miss the league championship game, which the Firebirds won. He was named to the ACFL All-Star team. After another failed trial with the Eagles in 1971, Corcoran returned to the ACFL and the Norfolk Neptunes, leading the league in completion percentage (52.6) and TD passes (17) as the club won the championship. He joined the Montreal Alouettes of the CFL for 1972 but quit rather than be a third-string quarterback and moved on to Chambersburg of the Seaboard Football League, but was injured midway through the season. He spent the ’73 season with Flint of the Midwest Football League. Corcoran joined the Bell of the new WFL for 1974, reuniting with Head Coach Ron Waller, who had been an assistant with Pottstown and head coach at Norfolk, as well as a number of other players who had been teammates with both of those clubs. Bell went 9-11 to finish third in the WFL Eastern Division. Lost WFL First Round playoff to Florida Blazers (18-3). Corcoran returned to the Bell in 1975 but lost his starting job to Bob Davis. 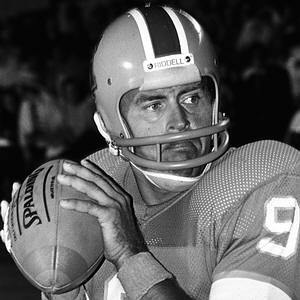 He completed 45 of 99 passes for 440 yards and three TDs with six intercepted before the WFL folded in October. Corcoran retired, “the minor league Joe Namath” having passed for 14,528 yards and 134 touchdowns over the course of his checkered and colorful career.